Remember Brandon & Angela’s Engagement Session? Remember that epic tree shot?! Ahhh we love these people! 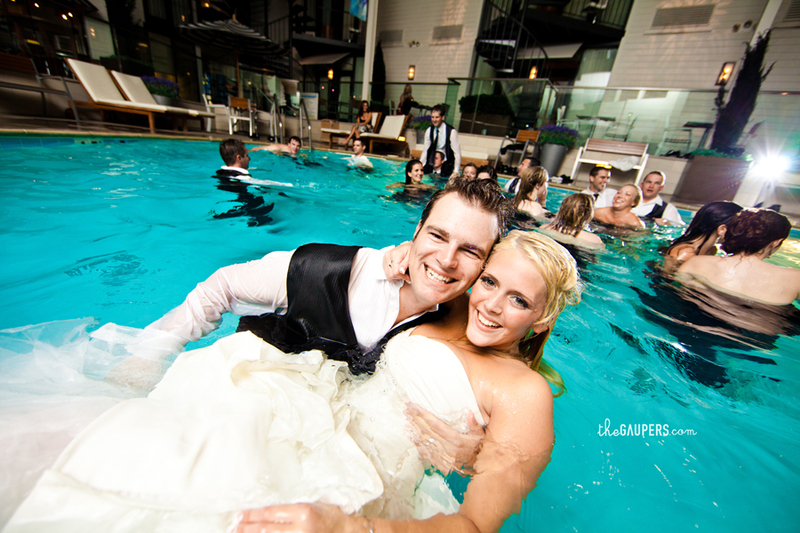 Anyways, back to the wedding… We were working till 10:30pm that night but decided to stay around a little longer. 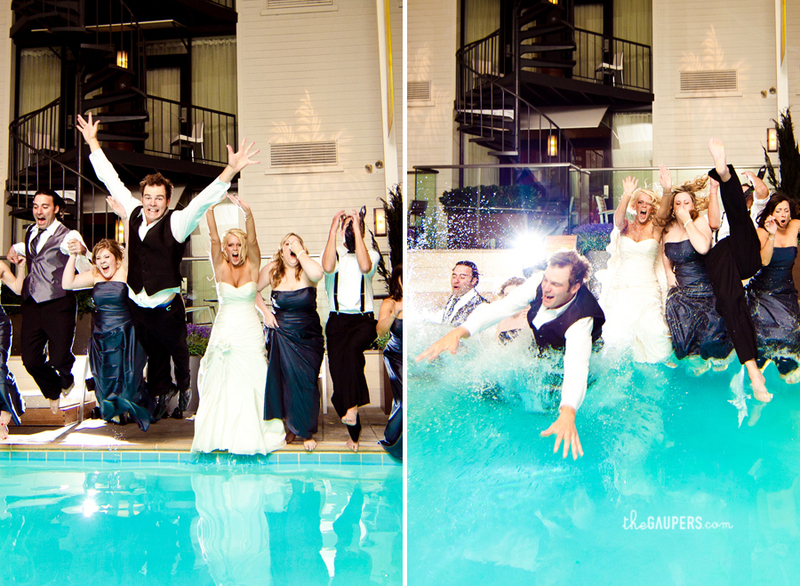 Then, they come up to us and tell us that the whole wedding party wants to jump in the pool at midnight and wondered if we would stay. I didn’t believe them at first but…ummm…yes, yes we will. It was a loonnng day, but it’s good to go the extra mile sometimes. 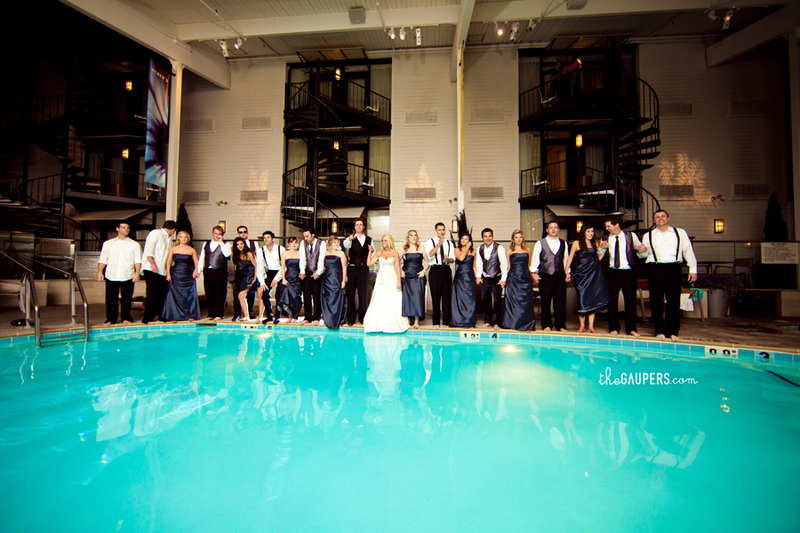 There were 19 people in their wedding party. 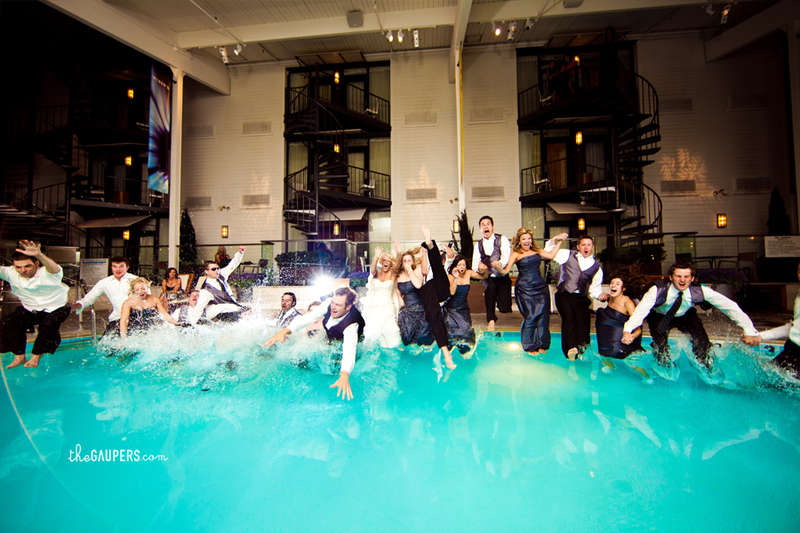 I was prepared for a splash, but didn’t really think about the flooding of the whole floor when all those people jumped it. It was awesome. I wanted to take some slow motion video of it, but it all happened so fast and I didn’t have time. However, one of the guests got it on video which shows what it was really like in that area…which is dark, haha. Thank goodness Ryan’s a total nerd when it comes to lighting. :) The video is at the very bottom. Ok everyone listen! It’s on Ryan’s count. 1, standing. 2, bend at the knees. 3, lift off and jump! 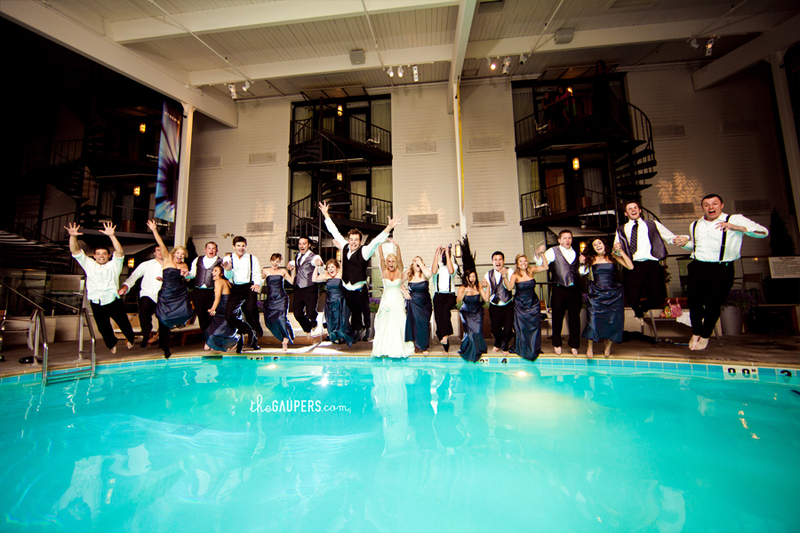 Ok look at the guy who is the second person to the right of the bride. His hands are up and he is vertical as he takes off in the left photo. Then, in the right his legs are up and forward. Now, I wonder… how is this guy not dead? If you look at where the edge of the pool is and how his legs are facing forward in the air, how did he not bash his brains in on the side is beyond me! I’m glad nobody got hurt…because that takes the fun out of everything. 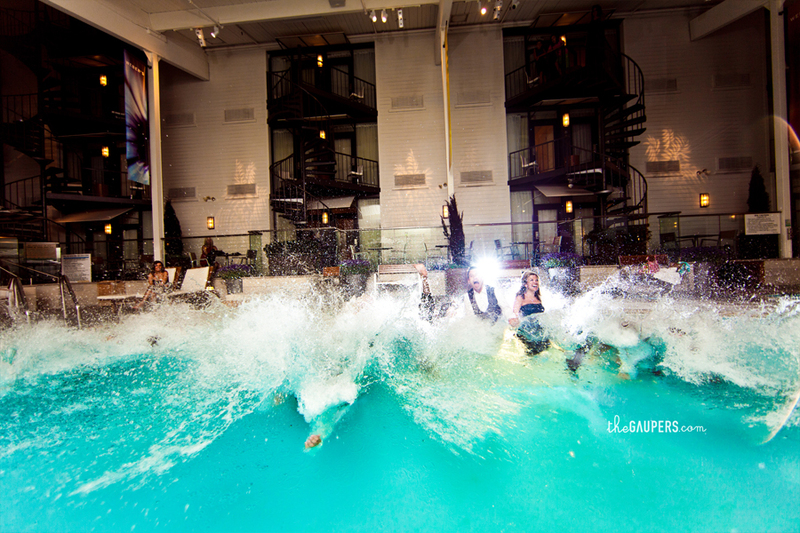 I so wish we could have done more with just Brandon and Angela in the pool but the manager was getting really ticked since midnight was closing time for the pool I guess. Either way, I’m really happy with what we got, it was a lot of fun! I am really excited to get started on their wedding so you should see another post about the more dry part of their wedding day coming soon! Jessica - Okay, you guys know I just love ya more than anything for posting this! If we dont all meet up soon and hang…Im going to cry!! I love it! 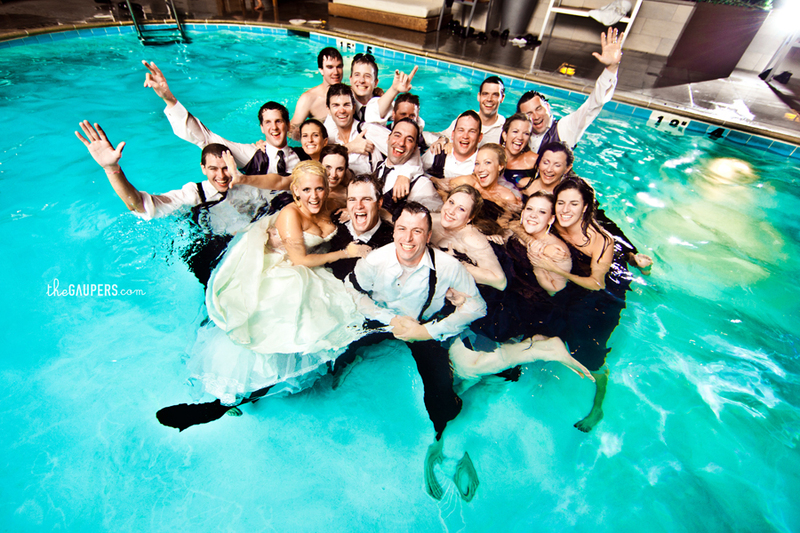 Fun, edgy, daring, not afraid to ask your bride/groom to jump in the pool…you guys ROCK!! What dates again are you in Sacramento this September? Wendy Herwyn - Wow, awesome! Are you still in touch with all these girls please? Can you ask them what they are planning to do with the bridesmaid dresses and the wedding dress please. I might be interested in buying these trashed dresses as is, no cleaning or repairs needed. I hope you can pass through my request. Thank you for your help, it’s much appreciated!